Weddings can be very stressful and bring out the best and worst in all of us. We are left balancing complex issues of: friends, dreams, teamwork, money, loyalties, jealousies, new in-law relations and endless practical decisions—all played out in front of your whole community of family and friends! No one gets through this without times of frustration, confusion, and sometimes anger. This book is an essential guide to handling the stress, avoiding the common pitfalls, having a great wedding, and launching a successful marriage. Take Back Your Wedding is the most sensible, compassionate and helpful guide for engaged couples available. I am giving a copy to all the couples I see for premarital counseling. 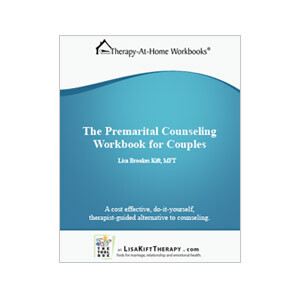 The Premarital Counseling Workbook for Couples is the first in my series of Therapy-At-Home Workbooks® providing a cost effective, do-it-yourself, therapist-guided alternative to premarital counseling. As a couples therapist I know that many embark upon marriage without having a basic relationship skills set. I encourage you to strengthen your relationship foundation BEFORE you tie the knot – to pack your toolbox for the inherent ups and downs of life. Strengthen your communication skills. I will help you tune up your talking and listening skills, one of the most important aspects of a healthy, strong relationship. Increase your emotional safety. An assessment and exploration of your respect, trust, understanding, validation and empathy for each other. Explore your relationship balance. A look at the “you, me and we” of your dynamic and whether it is satisfying to both of you. If not, how might it be shifted for the benefit of the marriage? Identify problematic family of origin issues. If one or both of you are carrying emotional wounds from the past, it’s important to identify them and their impact. Ideally couples understand and are sensitive to their partner’s soft spots. Explore your marriage logistics and roles: Are you both satisfied with the way your marriage works and “who” does “what?” Get on the same page to avoid potential unmet expectations and frustration. Develop your personal, couple and family goals; create a marriage vision: Create an idea of how you see your future together. You will be a team and ideally work together collaboratively. The Premarital Counseling Workbook for Couples provides a framework for you to strengthen the relationship foundation that will support your marriage. Its’ interactive format with worksheets and a space for journaling makes it a great keepsake for you and your spouse. It’s 67 pages will give you an understanding of the basic principles of happy, healthy and connected marriages. The workbook is an e-book, delivered in downloadable, PDF format. The price for the workbook is $20.00. You can order the workbook securely via PayPal. Immediately after completing the transaction you will receive a link to download the workbook so if you don’t receive it, check your spam folder for mail from client@e-junkie.com (the digital products company I use). Though this premarital workbook is a counseling alternative, it is not a replacement. See a local couples therapist if personal guidance by a trained professional is indicated.